The March 31st deadline to sign up for Get Covered Illinois health care, resulting from the Health Care Reform Bill of 2010, brings to mind earlier national legislation that was designed to protect and improve the lives of all Americans. One such example took effect this week in 1952. The passage and signing of the Federal Durham Humphrey amendment in October of 1951 required certain medications--identified as habit forming or dangerous--to be treated as prescription drugs with tight regulation of the prescription order process between doctors and pharmacists. 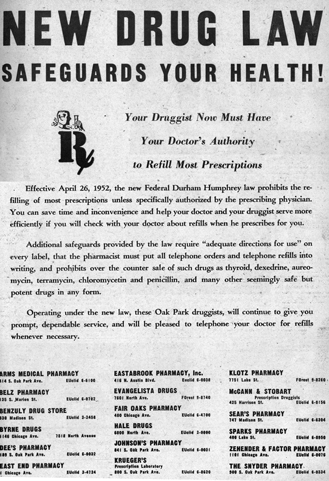 Eighteen local pharmacies banded together to promote awareness of the new regulations with an advertisement that appeared in the May 1, 1952 edition of the Oak Leaves. Prior to the amendment, anyone could purchase any drug over the counter without a prescription. The amendment was co-sponsored by former vice president and Senator Hubert H. Humphrey Jr., who was a pharmacist in South Dakota before beginning his political career.